First impressions count. And yet, while we know this all too well, when it comes to a job interview it’s easy to get carried away focusing on the rest of the interview and forget those first few crucial moments. If you want to make a strong first impression at your job interview then it starts before you even walk through the door. It’s far preferable to be early for a job interview than to be late if you want to make a good impression. If you do end up running late then call up and let someone know at least 15 minutes before the scheduled interview time and not after it should have started. You never know who is going to be consulted on the process of your hire. 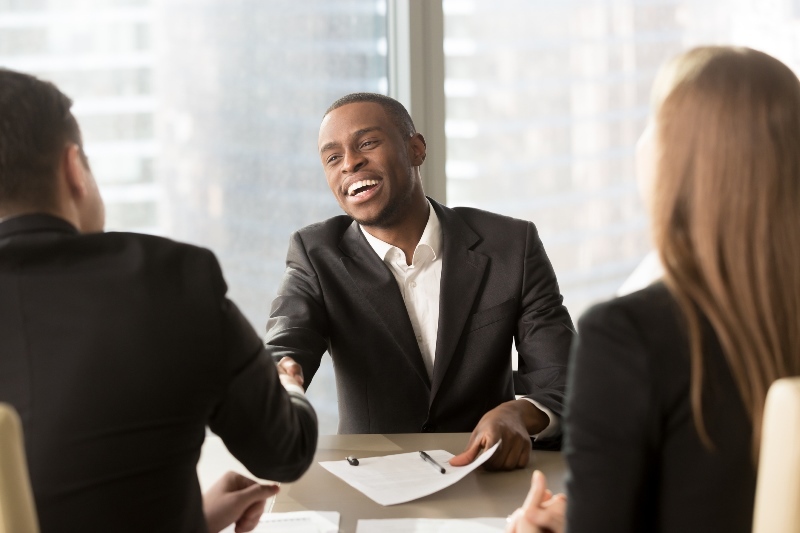 While you might be focused on impressing the interviewer or the hiring manager, if you’re not pleasant to the receptionist this can easily get fed back. In fact, some businesses specifically ask their welcome staff for their opinion on potential new hires. Find out in advance what the dress code is at the business you’re interviewing with and, if in doubt, go for formal over casual. Pay attention to the details that interviewers always notice – clean nails, an ironed shirt and shoes that are well cared for. Avoid wearing anything with rips, tears or stains in and tone down hair, jewellery and make-up. Above all, wear something you’re comfortable in so that you can focus on what is being said and not on how tight your suit is or painful your shoes are. If you’re taking a bag with you then clear this out the night before and remove anything unnecessary, as well as old tissues, sweet wrappers etc. Organise the contents of the bag so that you can find everything easily, from your business cards through to a notebook and pen if you’re planning to take notes. If you’ve been asked to bring certain documents then pack these in protective envelopes the night before so that they are not crumpled or tea stained when you hand them over. There’s nothing guaranteed to make you feel flustered more than carrying a million things into a room where there is nowhere to put anything and then trying to shake hands with people. So, when you arrive, get rid of the cup of coffee you drank on the way in, accept the offer to hang up your coat and try to carry only a single bag. Even as a guest in someone else’s office you can still be the first to introduce yourself and extend a hand. Being proactive demonstrates confidence and enthusiasm and will also show that you’re keen to make a start. Be the first to start the conversation with something that will help you to find common ground – even a quip about the weather or the traffic can be used to establish a connection. The process of successful recruitment requires attention to detail at every stage. We can help you to ensure that you get it right. Get in touch with 2i Recruit today on 01483 414719 or take a look at our blog for more job interview tips.team to talk about your business’ needs today and see how we could help with your recruitment. Posted by Jenny Jamieson in Candidates | Guides | Job Hunting | Top Tips.